~Rebecca. Oh, how I loved this book! Can't wait to participate in the Classics Bookclub on August 4th! ~How Sweet It Is. I'm in the middle of this one now, and really enjoying it. ~Cry in the Night because a good mystery makes me all tingly. ~Gilead. Heard so many wonderful things about this book, and I'm looking forward to diving in. ~Anathema. I just couldn't leave this one on the library shelf. ~A Praying Life: Connecting with God in a Distracting World. I've been chewing on this one for a while, and it's been wonderful. ~Womanly Dominion: More Than A Gentle and Quiet Spirit. The latest selection for the Girl Talk Bookclub. What about you? Reading anything good these days? Tell me about it. 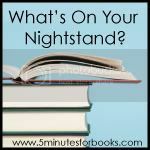 If you're looking for ideas on what to read next, hop over to 5 Minutes for Books...though I must warn you, your "to be read" stack may become dangerously high. At least, mine always does! I need to quickly read Rebecca! It crept up on me! I read Rebecca some years ago and I have some very good memories of it. Another one to reread! It's been years since I read Rebecca, but I remember loving it! I'm looking forward to diving into Womanly Dominion soon. I thought Rebecca was a romance for years until I found out Hitchcock filmed it. I figured there must be more to it and I enjoyed it a lot when I finally got to it. I loved Gilead, I'm sure you will too. Happy reading. And thank you for visiting Fresh Ink Books. I have a review of "Home" Marilynne Robinson's second novel in draft now (or third I think -- but right after Gilead). I listened to the audiobook and loved it, but I'm still not sure I'd love Gilead. You can write it up if you want, because it's one of those books that everyone either has read or wants to read! I hadn't planned to read Rebecca but I'm thinking about it now for the book club. Womanly Dominion sounds good! Both Cry In The Night and Anathema are great reads. Enjoy. I've been thinking about joining the GirlTalk bookclub for Womanly Dominion it definitely looks interesting. You have some real variety here. Enjoy!